An MSE-6 Droid, informally referred to as a Mouse Droid, is a small, black, box-shaped droid from the Star Wars theme. They appear in three official LEGO sets and in three video games. 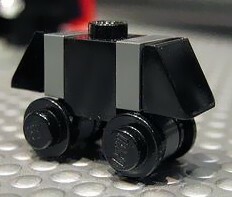 The first variant of the Mouse Droid consists of nine parts - seven black, and two medium stone grey. It has four wheels and each end has a downward slope. The second variant of this minifigure had dark stone grey pieces instead of medium stone grey. MSE Droids were employed on Imperial and Republic ships and space stations to guide troops and ferry data around the massive mazes of corridors. Their size and shape, quick movements and squeaky sounds - all intended to make them unobtrusive on-board busy vessels - quickly earned them the nickname "Mouse Droid." The droids were given one task at a time - as their intelligence levels were low - but once on their task, they would do nothing else. A Mouse Droid as it appears in the first two video games. This page was last edited on 16 July 2016, at 20:47.